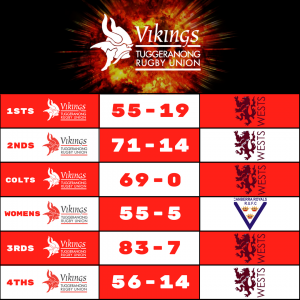 The Vikings didn’t disappoint in their final home game of the season, each Grade running riot in some big victories over the weekend. The Premier Grade and 1st Division sides took on Wests, while the ViQueens faced Royals in a top of the table clash for the Women’s Division. The victories move the Club closer to a rare feat – having each Grade in the Major Semi-Finals come August 4th. 4th Grade took the field against Wests without inspirational Captain-Coach Grant Lukins to lead them out, but this certainly didn’t hinder them as they put on a show for those who braved the cold to watch. 4th Grade made light work of their opponents early, the backs beautifully controlled by flyhalf Cameron Shaw. Pistol Pete Conroy was at his destructive best, running and hitting with power. The Vikings looked great with ball in hand, but allowed Wests into the game several times in the first half by conceding possession and allowing the Wests backline to take the advantage line. After 20 minutes of play the Vikings lost their dominant scrum, after Ryan Slater started a fight and ran from the field when the player retaliated. Ryan was later seen driving rather quickly towards the exit of Viking Park. Despite this, the Vikings managed to build some solid phases by keeping ball in hand and came away with a convincing victory, 56-14. A special mention to Club favourite Kaleb ‘Cadbury’ Dalla Costa – in his first run on game for the Vikings, Kaleb picked up Man of the Match and Player’s Player honours. 3rd Grade scored the highest amount of points on the day, led by a frenzy of tries by returning fullback Dean Wilson. Dean was electric on the weekend, his every touch of the ball proving effective for the Vikings. As always in 3rd Grade, the Vikings forward pack dominated possession, playing some good structure but enjoying a free flowing match. Nick Cushan led the forward pack, the burly prop a wrecking ball in attack. Andrew ‘Chewy’ Dickson feverishly tried to chase down Brendon Taueki’s point scoring record for the season, contributing 20 points in a blatant disregard for his team mates at times. It was an impressive performance by 3rd Grade, who need to continue their current form to maintain their chance of playing in a Major Semi Final in a few short weeks. Just about every one got a piece of the action, in a commanding 83-7 victory for the Thirsty Thirds. For the second time in two weeks, the ViQueens played another top of the table clash, but this week against old nemesis Royals. The ViQueens started quickly from the kick off, using their strong ball carriers to take the advantage line, build phases and march up field. Regan Hart was able to make her mark early, using her blistering speed out on the wing and proving a brick wall in defense. The impact of the forwards set the ViQueens up for a point scoring frenzy in that first half – led by Stef Stewart-Jones, the forwards continued to bash their opponents, opening up plenty of space around the fringes of the ruck for Remi Wilton to exploit. Remi would finish with 4 tries for the day, Player of the Match and Player’s Player. By the beginning of the second half, the ViQueens had already proven their dominance and were able to play some expansive footy, which was a delight to watch. The ViQueens continue their undefeated season, 55-5. The Colties kicked off proceedings for the Premier Grades and certainly didn’t disappoint, putting on a spectacle for those in attendance. The Vikings were met with some resistance in the early stages of the match by Wests, who were determined to shake up the young Vikings who are still undefeated in season 2018. But the Vikings were able to weather this early onslaught – some bone rattling defence from Luke Corcoran and some excellent communication by Darcy McLeod put the Vikings on the front foot and allowed them to regather possession and pile on the points. Jerry Landu had a field day, the nifty Fijian winger putting all his skills on show to cross for a brace of tries and help set up just about every other. It was an all round great performance from the Colts, who were equally impressive in the forwards as they were the backs. Another victory to the tally, 69-0. After two disappointing losses in their last two matches, 2nd Grade made amends with a big victory over Wests. The Dirty Twos were clinical in attack, with the majority of their tries coming from line breaks from within their own half, with good support lines and an early shift if the ball went to a ruck. The back three tipped the game in the Vikings advantage – Nic Marshall and Nic Murray scored a hat trick and a brace respectively, while Max Ravouvou had his hand in just about every linebreak. It was Billy Carberry who impressed, though – continued his outstanding season, Billy’s running lines straightened the Vikings attack and creating plenty of opportunities for the players around him. A great win for 2nd Grade that had Coach McNicol smiling, 71-14. 1st Grade capped off the day with another equally impressive victory, guaranteeing them a spot in the Major Semi Final on August 4th. 1st Grade were challenged early, the Wests pack coming out all guns blazing to gain an advantage in field position. The Vikings were able to weather the storm in the first 20 minutes and from then on never looked like losing the momentum. Ryan Lonergan was outstanding, his support lines off proven line breakers Brendon Taueki and Jordan Jackson-Hope added extra metres onto the Vikings attack and resulting in several tries as well. His halves partner Noah Lolesio was also at his best, taking several opportunities to run himself which proved effective. What was most pleasing was that, for all the razzle dazzle Rugby that 1st Grade produced, they were still able to maintain their structures and build momentum with some smart, fast footy. They now have a bye and then face Easts the week after in what could potentially be a do-or-die match at Griffith Oval. The Vikings will take a lot of confidence from their match against Wests and will look to maintain this heading into the finals. Vikings 55-19. 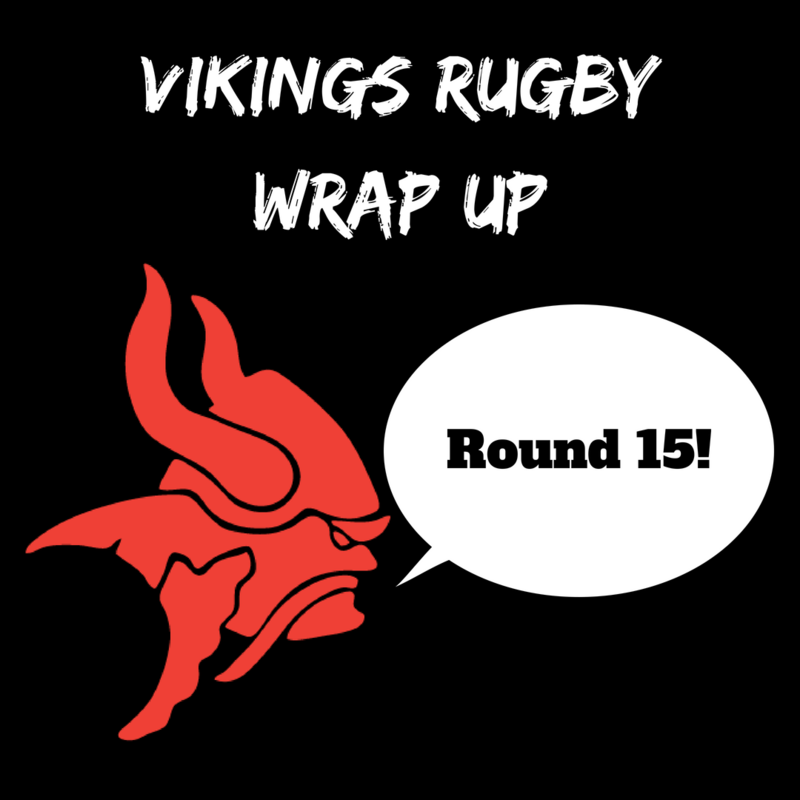 That’s a wrap for Round 15 – the Premier Grades have a bye while 1st Division take on Cooma at Viking Park and the ViQueens head over to Griffith Oval to play the Eagles this weekend. Stay tuned to our website and social media for game times!